Launched in 1929, the 20/25 followed established 'small' Rolls-Royce practice in that it was conceived and built to the same exacting standards as its larger Phantom II stablemate. Developed more or less side-by-side the two models shared improvements introduced during their respective series including thermostatically controlled radiator shutters and pedal operated chassis lubrication. Although, based around the same leaf-sprung, drum braked chassis design as its 20hp predecessor, the 20/25 enjoyed notably sharper acceleration, a higher top speed and better fuel economy thanks to its enlarged 3669cc, straight-six OHV engine. Available with synchromesh on third and fourth gear from 1932 onwards, the 20/25 quickly drew praise form the contemporary press, Autocar noting that it had "great refinement of power, and a gentleness and quietness in doing its work, which makes results deceptive". Unlike its 25/30 successor, the 20/25 remained true to founder Henry Royce's perfectionist principles and abhorrence of bought-in components. 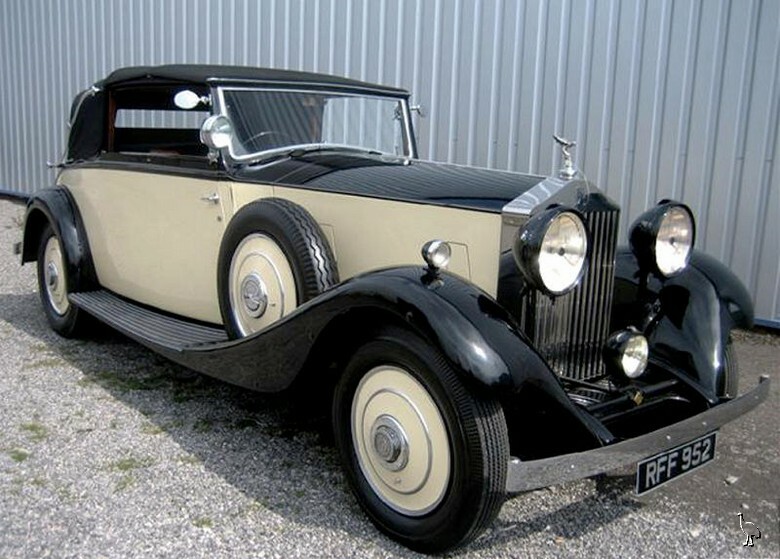 Fitted with decidedly elegant Three Position Drophead Coupe coachwork by James Young of Bromley, chassis 'GHA 28' was supplied new via Messrs Pass & Joyce of London NW1 to William John Herbert De Wette Mullens. The sole owner listed in its accompanying old-style logbook, Mr De Wette Mullens seems to have retained the car well into the post-WW2 period. Indeed, its only other known keeper is a Mr John Stokvis of Sands Point, New York who appears to have taken possession in 1995. Reportedly the subject of an extensive restoration carried out in Mr Stokvis' own workshops between 2000 and 2004, the Rolls-Royce bears close scrutiny. Able to boast its original coachwork, unlike some of its peers, the 20/25 is finished in black over cream with black leather upholstery. Other pleasing features include a rear luggage grid, black painted Lucas lighting set and Ace wheel discs.